Romero believed in a Jesus who called His people to join God in making right what sin and death had made wrong in this world. He believed that the pursuit of biblical justice and the reconciliation of all people to God and one another, including the reconciliation and forgiveness of the oppressed and oppressor, was paramount to the gospel. He believed that all people were made in the image of God and should be treated as such. On March 24, 1980, after speaking out against U.S. military support for the government of El Salvador, and calling for soldiers to disobey orders to fire on innocent civilians, Archbishop Romero was shot dead while celebrating Mass at the small chapel of the cancer hospital where he lived. To this day no one is certain who was responsible for his assassination. There must come a day when these words move from the printed pages of Scripture to the witness of God’s people actively present in society. We must do more than affirm these teachings in our gatherings or on social media. They must be embodied and embraced as a new of being in society that leads to a different way of doing life in society as a people in submission to the Lordship of Jesus. So why Oscar Romero? Well, his life reminds me that this way of being and doing will not be received by all, including those who bear the name “Christian.” The truth is some Christians are more unknowingly culturally-minded than kingdom-minded. Many bearing the name “Christian” will vehemently deny that there’s anyone to “speak up” for and will label you with politically-charged categorical names. Many will deny that reconciliation is more important that cultural, historical or national commitments. Many will deny (implicitly rather than explicitly) that loving neighbor actually does mean treating them as they would be treated. Jesus once said (and the context of this statement is so important), “A prophet will not be accepted in his own hometown.”4 Don’t let Jesus’ words discourage you. I don’t believe they were meant to. I think they were offered as a statement of what is and what will be when we take His proclamation to heart and follow Him in making it our own. In a North American culture where civility is lacking and civic freedom is valued above all else, don’t be surprised when criticism and opposition comes from those closest to you. 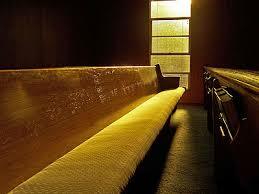 You will feel the pressure of opposition from one end of the church pew to the other. It is what it is. Jesus knows it. The disciples knew it. Oscar Romero knew it. You and I need to remember it. In his most provocative sermon Jesus once asked, “Why do you call me Lord and do not do what I say?“5 Most that come against the good news of justice, reconciliation and peace will not know how to answer. Let’s make sure you and I know how, and let’s do so humbly. Like Oscar Romero, the disciples and our Lord, we cannot back-up, give up, shut up, or even buck-up with a reactionary, antagonistic ticked-off posture. We must choose to be faithful, surrender to the Spirit, and embody the gospel we proclaim, even toward those criticizing from the church pews. And we must remember that the blessed presence of Jesus and the joy that comes from standing with Him far outweighs the labels, allegations and criticisms arising from critics and politics dressed in the clothes of religion. 4. Luke 4:24 (read the whole context beginning in Luke 4:16 and catch what Jesus does in 25-27). There is a popular meme on social media of a supposed quote by rap artist Eminem which states: “I don’t care if you’re black, white, straight, bisexual, gay, lesbian, short, tall, fat, skinny, rich or poor. If you’re nice to me, I’ll be nice to you. Simple as that”. I think this fairly accurrately describes the moral ethic of America right now, and while on the surface it looks nice and all, it struck me almost immediately as not good enough. In Romans 13 verse 8 it says ‘Owe no one anything, except to love one another, for the one who loves his neighbor has fulfilled the law.’ During lectio Devina in service yesterday I interpreted these words to mean – ” I owe everyone my love”. I focused on the words, “I owe”. In other words – this is my starting position with everyone. In our transactional culture, Eminem’s words certainly resonate – but we Christians are called to a higher ethic. Rather than sizing someone else up, judging them according to our own subjective view of who is nice or not, we Christians are called to a posture of Love regardless of whether a person is nice or not. 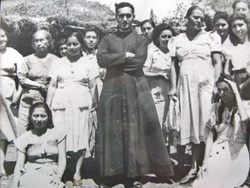 The enemy love you described in your account of Oscar Romero is exciting and radical – and to get one step closer to that kind of Christ-like compassion we can first seperate ourselves from the popular ethic of reciprocity and adopt the stance that regardless of who it is, we OWE our love to everyone.